Second instalment of a novel serialisation. Shane Tourtellotte. Acts of Conscience. In ‘A New Man’ (Oct 2003), to which this is a followup, Tourtellotte explored issues of rehabilitation of criminals through the use of mind wipes/overlays. Here he looks at other ethical issues with the technique, as Dr Lucinda Carr is shocked when an actress who wishes to become a major star asks her to perform a neural overlay to improve her ‘fit’ in Hollywood (she’s had the physical side modified to meet the perceived requirements). Whilst Dr Carr does neural overlays for correcting psychological disturbances, this is a most unusual (and not legally sanctioned) request. Ekaterina Sedia and David Bartell. Alphabet Angels. More scientist fiction, but slightly more off the wall than is oft the case in Analog. A female lab technician strickes up an unlikely dalliance with a local pet shop owner, who is more than he seems, and whose fish are -definitely- more than he seems. He is in fact a reputed MIT scientist, and whilst his genmodding fish to have letters on their sides and to spell words started out as a joke, it seems that the fish are getting clever all the time. Quite entertaining, especially the first half, where the techie stuff is very secondary to the budding relationship and fishy spelling bee. James C. Glass. Dark Peril. A perfect example of Analog Scientist Fiction – written by a Physics Professor with a middle initial, a crew are put in jeopardy when attempting a flyby of an anomolous gravitional thingie, but are saved by some research one of the onboard scientists carries out. The story is basically about Ergosphere and The Penrose Process : ‘The Penrose Process is an interesting phenomenon that can take place inside the ergosphere by taking advantage of the fact that time-like vectors outside becomes space-like inside, but yet matter can still emerge from within. Imagine a particle A that enters the ergosphere from infinity. Inside the ergosphere, it splits into two particales B and C. Particle B will plunge into the event horizon, whereas particle C emerges from the ergosphere and goes back to infinity’ (http://www.physics.ubc.ca/~psih/kerr-metric/node6.html). Obviously ‘the Penrose process in an interesting process‘ is a subjective opinion, and the extent to which you like your SF to contain very detailed scientific theory will impact on your enjoyment of the story. Carl Frederick. General Tso’s Chicken. A group of awkward teenage young scientists wreak havoc on one of the two orbiting habitats – but when they pay a visit to the Chinese-owned other habitat things get very tricky, and there are some maneouverings to be done to avoid a Sino-American dispute. 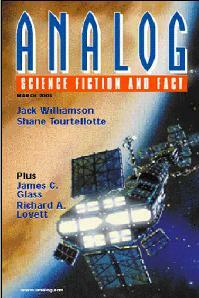 Your average scientist fiction Analog issue, with only the Sedia/Bartell providing a slight variation from the norm.